Guys, I didn't share this before because I have a wild imagination that takes away from me especially into the dark hours of the night and wee hours of the morning. But, last week from Sunday to Friday night, my husband was in banking school and I was home alone...all day and night. I thought I would be able to rest so well in that big bed all by myself, stretching out and using all the pillows I wanted. Not to mention, a quiet night with no tv or snoring! Let me tell you, it was the complete opposite. I blamed it on pregnancy the first night - not being able to get comfortable, required to sleep on my left side. By the third night, when I was exhausted and still wide awake after midnight, I realized it had nothing to do with pregnancy. I wasn't uncomfortable or in pain; I just wasn't at ease. I'm so excited he is home now. Being home alone has never been something I enjoyed. Before marriage, when I lived by myself, I would lock the front door (several locks) and my bedroom door at night. I kept my phone and keys right beside my bed and made sure to have a first floor apartment so I could get out my bedroom window before anyone could get into me. I even locked the bathroom door while using the bathroom in case someone came in! In college, my roommate and I actually had the option of having our own rooms. Instead, we put our beds in one room so we could sleep in the same room and put our desks/dressers in the other room so we could get ready and do work without keeping each other awake. I've always been so independent and such a free spirit (laid back, go with the flow) that I never realized my dependency on others. After 3 years of marriage, I don't want to be away from my husband (unless I have to). Now, I'm not saying I don't enjoy alone time - I loooooove "me time." I got so much done this week: cleaning, nursery inspiration board, prepped for a yard sale, etc. But that is all during the day time! I'll take my "me time" when the sun is shining. How about you? It is very different to sleep alone now. You are looking so cute! Hope you are feeling great and enjoying it. AHH you look great girl!! :) Hope you are feeling great and able to sleep better and rest more easily now that the hubby is home! I am 100% the same as you. I hate when my husband has to work nights. I sleep terribly cause I am constantly waking up because I hate being along, I hear a noise, I wonder if he's okay at work. It's just terrible. I much prefer me time during the day as well. Give me a few hours to get my stuff done, watch my cheesy girl shows, but when it's dark be home with me!!! Also, I am incredibly jealous of your $5.98 clearance top!!! i am so with you. i love me time, but sleeping at night is so much better when my husband is next to me! I am the EXACT same way! I HATE being alone at night, but during the day I'm all about some me time! Cute bump! girl i am the SAME way!! i did the exact same things before i was married but now i HATE when my husband is gone! i hate it when my husband is gone!I go sleep at my parents! 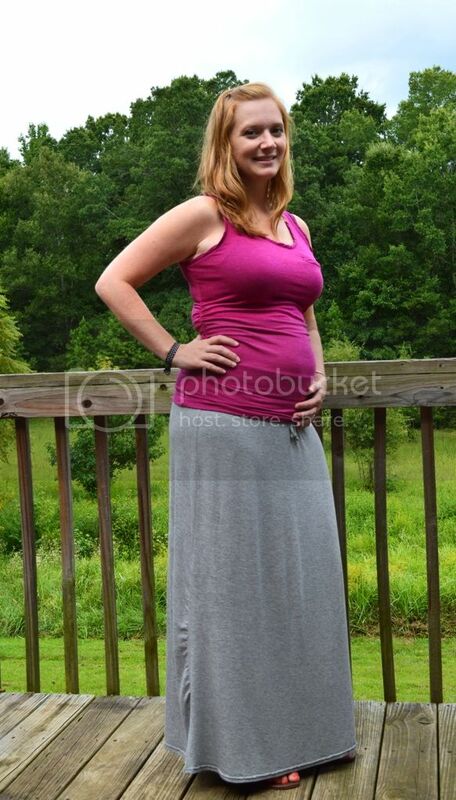 :) love the tank and maxi - i wore that all the time at the end of pregnancy! My husband was gone for 12 weeks this summer for his summer grad school internship. I thought I was going to die. every.single.night. I always gets scared when I am home alone too...I sleep with the bathroom light on!! LOL! You are NOT alone!! Love your outfit! You are seriously too cute pregnant! 19 weeks and the BIG reveal!